Very nice, very nice. Duff and the gang continue to rock. I can't stop smiling at this one - it's both adorable AND geeky: my favorite combo! Those are all fabulous, of course, but Kendra's find is the hands-down winner. Get ready, geeky guys and gals, 'cuz here comes a Stargate wedding cake. Awwww yeeeeeah! And you thought geeks had no sense of elegance. C'mon, just look at this thing! I love all the little touches of red throughout the design - just beautiful. You can see a few more shots here, where the groom writes that the wormhole connection is actually hand-painted icing. I could have sworn that was an edible printed image, so color me impressed. Plus, the entire cake was made by his in-laws - how cool is that?!? It takes all kinds to make this world go round!! Wwwwoooow I so want one of those for my birthday!!! Well, aren't those just ADORKABLE?! This is by far my fave post too. I L-O-V-E Stargate (both Atlantis and SG-1) so of course I love these cakes. The wedding cake is just awesome. Thanks for this. Pity no Atlantean ones with Shep being Shep. Wow! 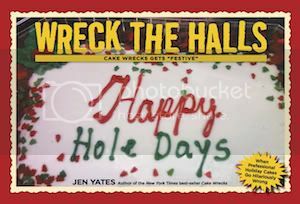 Though I do want to know how much of those stargates with holes in the middle are actually cake. Is the cake all underneath? Anyway, the wedding cake, that is amazing. If you look at the extra photos even the bride's dress and hairstyle are recreated in the topper! It's kind of pathetic how sad I am about the lack of SGA cakes. But these are all pretty awesome. By now probably everyone knows my opinions about themed wedding cakes, but I must admit this one is charming. I don't know Stargate from a hole in the ground, but I love that cake and would love to hav gone to a wedding where it was served. If you look at the extra pictures of the wedding cake, you'll see the decorator did some amazing detail work, even including pockets for the groom! I'm with Bilby P. Dalgyte on this one... how is the top tier of the wedding cake held up? It looks to be hovering! Nobody says anything about it on the other forum where it is originally posted. YES! i cannot wait until you post a Star Trek Sunday Sweet. Of course, being the geeky trekkie that i am, i'd have to insist that it was TOS. Those are great! A testimony to what can be accomplished with a talented baker and a great show! So do we have any explanation who's being sucked through the wormhole? Is it the birthday boy, or did he give an evil surfer dude system lord a little push? Cakes for the utter WIN. for those of you wondering about the "levitating" tier... it is actually on a metal stand... the support is behind the cake rather than directly under it. How could someone not want to sculpt an elaborate and accurate version of Atlantis out of cake?! Surrounded perhaps by a fondant ocean and a couple of cakey puddlejumpers hovering on fishing line. And I must admit that last year, I spent rather a lot of time helping my roommate painstakingly reproduce each unique gate symbol in gel icing for her sister's birthday. That's so weird you would post this now- I just had a Stargate birthday cake last weekend. Who said geeks didn't have a life? My husband and I are big Stargate fans and this makes me smile. I am *loving* today's post, I really need to make up for the lack of SGA cakes now though. Mind you I just got back from the home of ultimate geekiness and 'Gatedom, Vancouver. How awesome would a drone cake be though?! Wow! SG cakes are awesome!!! Who said geek couldn't be chic?? Lovely. What a talented bunch! This was my Stargate Wedding Cake. It's much more impressive in person. The gate actually lights up to make it look like the gate is activated. They are awesome. 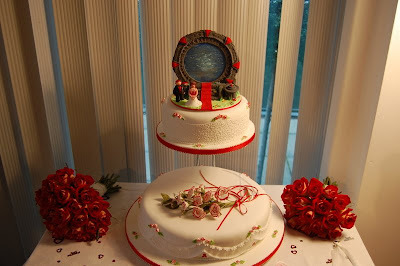 I wish I had a stargate wedding cake. I,too, have been a follower of this blog for a long time, but now I had to leave a comment. It was enough for me, the star trek, star wars cakes, the Dr. Who references. But now Stargate! I have a whole new love for this blog. what the dogtron is stargate atlantis? Wow! Those cakes are all sweeeet! The groom is one lucky guy to have inlaws who can make such a gate cake! I think not using a sheet of multihued blue hard candy for the wormhole was a missed opportunity, here. Now I feel like I have to try a Starcake of my own, out of sheer competitiveness. My fiance came over and right away knew what kind of cake we're having for our wedding. There was no say! I completely agree. I love how they have ALL of the glyphs around the wedding cake Stargate one!! I'm not saying one is better than the other, I'm just looking for parity here. Well being a HUGE fan of SG-1 and Atlantis....this is by far my absolute most favorite sunday sweet yet!! I absolutely MUST have that wedding cake if ever i get married!!!!! Awsome Stargate Cakes!! So, this is the entry that brought me here. But I literally had to hold myself back from clicking "older posts" again in order to get sleep. I think what draws me to this blog more than the CCC, the pooh cakes, or even the horrendous misspellings and grammar mistakes is the fact that you, my friend, are also a fellow geek. The Dalek entry was perhaps the most hilarious Dr. Who related blog entry I've seen since...I last saw a Dr. Who related blog entry. Over the years, Chef Duff of Charm City Cakes has made an Imperial Star Destroyer for me, along with the Death Star, the Great Gallery rock art and a few other cakes. They're making my 40th birthday cake this year and I can't wait. I never thought to ask him about a Stargate! Totally awesome. I had to post about this in my own blog, hope you don;t mind. Somewhere I have seen a Puddlejumper Cake! I must try and track that down as it looked very good! 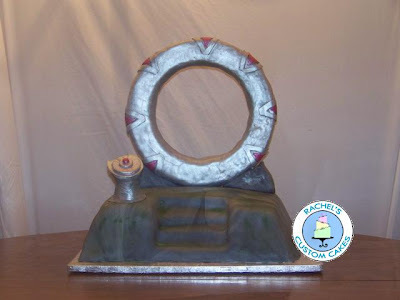 why not get a hand sculpted personalised cake topper to accompany your great looking stargate cake? I have just had a fabulous Apollo Astronaut Topper made (using my face)...and i know Sharon at sculptedbliss.co.uk would love to make more "character" figures. Fabulous! Keep up the nerd cakes and the covert Harry Potter references. I laugh out loud at every post - thank you! Wow, those are some amazing in-laws. I think I just had a geekgasm . . . Although seriously...is it too much to ask that someoen make the stargate with blue chevrons instead of red, and a green wormhole? That would make it a lot closer to being Atlantis. I love-love-LOVE the one of the guy coming through the 'gate! AMAZING!!!!! And the wedding cake! I need to marry a geek so we can have that cake! This = most awesomeness post ever. This totally screams GEEKAGE, I love it! Sigh, sent a link to this post to my family as a joke because my mom loves Stargate and her birthday is coming up. Now the whole family wants me to get one. For real. My husband and and I are currently watching the entire series of SG-1 and anytime someone gets promoted or a medal, we have decided they celebrate afterwards with a Stargate shaped cake in the briefing room, like people do at actual office celebrations. So seeing these makes me giggle a lot. fantastic - SG and cake - what more could you ask for!! I cannot even express how utterly awesome this post is. Pretty cakes + Stargate = WIN. I LOVVVVVE Stargate ... both Atlantis and SG-1.... DH and I are total nerds.... I sooo wish I had more time to dream one up for his bday tomorrow.. LOL! 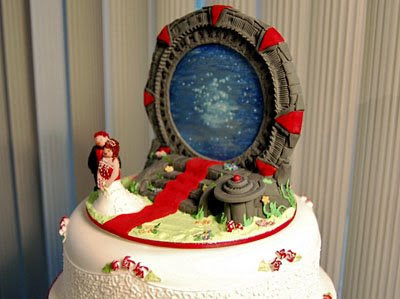 Dang, why didn't *I* think of a Stargate wedding cake?! We are that geeky, after all. I'm going to have a second wedding just so I can have a SG-1 wedding cake. Pure awesomeness. And The Cheap-Arse Film Critic, it did need to be said, rofl!! (looking down, shuffling feet in embarassment) Glad everybody explained the Stargate thing, because I thought it was Xena's chakram. Oh, I love the geeky, adorable one but the wedding cake should be a Grooms cake instead ! Love your site! LOVE the stargate cakes!! 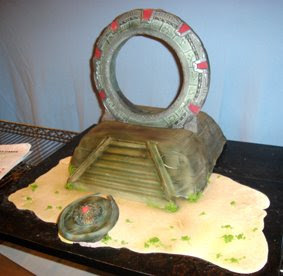 I did a stargate cake a few years ago for my (then) husband's birthday. Our group of friends are all stargate geeks and we'd get together on Friday nights to watch SG1 and SGA... My ex is an elephant collector as well (elephant figurines, of course!) so there's an elephant coming through the stargate on my cake. Definitely NOT professionally done, but we had fun with it. OMG!!!!! I saw from a link in today's sunday sweets. How can I have missed this one?! These are so cute, though I have to say my favorite is the last one. 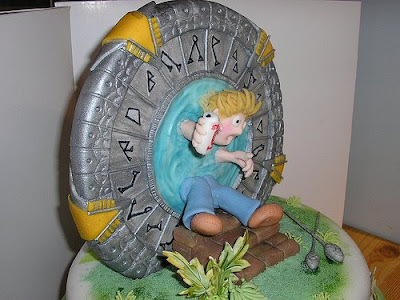 Damn now I must make a Stargate cake, even if it just a glyph of Earth or Atlantis. Perhaps a whole gate address.